Naples (Italian: Napoli; Neapolitan: Napule) in Italy, an ancient port on the Mediterranean sea. With just short of a million citizens, is the third most populous municipality. Metropolitan Naples is Italy's second most populous metropolitan area. Naples represents one of the oldest continuously-inhabited cities in the world and a UNESCO World Heritage site with an unmatched heritage as a place of exchange between cultures. This is reflected in the city's structure and monuments, which are a mixture of Greek, Roman, Norman, Angevin, Spanish and French architecture. The UNESCO evaluation committee described Naples' historic centre – the largest in Europe – as being "of exceptional value", and went on to say that Naples' setting on its Bay "gives it an outstanding universal value which has had a profound influence". But Italians have known these things for centuries: The view of Naples from the sea is so beautiful that a traditional Italian saying states that once you've seen it, you can die. As a testimony to its extraordinary history, the Naples region hosts an unparalleled concentration of UNESCO World Heritage sites: the Center of Naples itself; the Roman archaeological sites of Pompeii, Herculaneum, Cumae, Pozzuoli, Oplontis and Stabiae; the Royal Palace of Caserta; the royal site of San Leucio and the Aqueduct of Vanvitelli. It is close to Vesuvius, the only active volcano on the European continent and a UNESCO Biosphere Reserve. Paestum's Greek temples and the Amalfi Coast are possible day trips, as are the islands of Capri, Ischia and Procida in the Bay of Naples. In literary history, Naples is known as a favorite destination of the Roman poet Virgil. This is where he wrote the Roman national epic "Aeneid", and where he was eventually buried. A more contemporary Neapolitan author is the pseudonym Elena Ferrante, whose Neapolitan Novels follow two girls growing up in a poor Naples neighborhood from the 1950s and onward. Naples was the World Capital of Cultures in 2013, and it hosted the Universal Forum of Cultures (UFC) from April 10 to July 21, 2013. The city was founded in 8th century BC as Parthenope, by Greek settlers from the nearby city of Cumae, itself founded by Greeks from the island of Evvia, in the area between Monte Echia and the island of Megaride, on a previous 2nd millennium BC settlement named Phaleros, a name connected to one of the Argonauts. The Cumaeans founded Neapolis ("New City") at the area of today's Piazza Municipio in 6th century BC, and the town became one of the most important Greek polis of Magna Grecia and the whole Mediterranean Sea. In 320 BC, the city was conquered by the Romans, who let it maintain its Greek culture and language. With the fall of the Roman Empire, the town was conquered by the Byzantines, to became capital of an independent duchy. Naples was later governed by Normans, Swabians and Angevins, who made it a capital; the King of Sicily became King of Naples after the Sicilian Vespers. During the first half of 17th century, Naples was one the main centers of the Spanish monarchy, and the most populated city in Europe, with more than 400,000 inhabitants. After tragic events, like an eruption of Mount Vesuvius in 1630, the revolt of Masaniello in 1647 against the Spanish government, and the plague that killed half of the population in 1656, Naples reached a glorious period under the government of the House of Bourbon, that made it one of the most relevant cities in the continent about culture, economy and politics. Following the French and Napoleonic invasions, the Kingdom of the Two Sicilies was established in 1815, restoring the Bourbon dominance over Southern Italy and Sicily and making Naples the third most relevant city in Europe and the first one in present Italy for inhabitants and economy. The annexation of the Two Sicilies to the newborn Kingdom of Italy in 1861 spelled, in fact, the beginning of a long period of decline for Naples and all Southern Italy. The town suffered the heavy bombings of World War II, that left deep scars in its monumental heritage, but succeeded to kick out the German occupiers during the revolt known as "the four days of Naples". The Historical Centre, or Centro Storico of Naples is not only amazing but can also be something of a maze, filled with small irregular alleys. While the exact limits of the Centro Storico are a matter of debate, an inclusive definition could set its boundaries to Via Floria in the north, Corso Giuseppe Garibaldi to the east, the waterfront to the south and Via Toledo and the Quartieri Spagnoli to the west. Out of this huge area, the sections found to the north of Corso Umberto I, and to the west of Via Duomo are most likely to be of interest to travelers. While orientation in this area is difficult there are a few main roads by which you can direct yourself. Corso Umberto I cuts across the Centro Storico from the north-east to the south-west, connecting to the central train station in the north-east, and is one of few major multilane roads in historical centre. At Piazza Nicola Amore it crosses Via Duomo, a major road going across the centre from north to south. Finally, Via dei Tribunali and Spaccanapoli are two long, but rather narrow and crowded roads crossing the centre from east to west, both packed with street vendors and old churches. Notice that Spaccanapoli (literally "Naples splitter") is an unofficial name. The street's official names are Via Benedetto Croce for its western part and Via San Biagio Dei Librai for its eastern section. After crossing Via Duomo it loses much of its character, but continues east under the name Via Vicaria Vecchia. South-west of the Centro Storico you will find the area San Ferdinando, consisting of a large headland into the bay of Naples. The area has long been the regal centre of Naples, with the two medieval castles Castel Nuovo and Castel dell'Ovo, and the old Royal Palace of Naples. Via Partenope and Via Nazario Sauro, packed with restaurants and hotels, follow the San Ferdinando waterfront and provide you with a beautiful view of the bay of Naples. Other areas of interest to tourists are Chiaia, an affluent district with plenty of opportunities for shopping directly west of San Ferdinando; and Vomero, a hilly residential area north of Chiaia and west of the Centro Storico, which due to its elevated location provide panoramic views of the bay and Vesuvius. Finally, aside from being beautiful, the bay to south of Naples and the mountain Vesuvius on its east are also good points of orientation, as they can be seen from several locations in the city. Naples has Mediterranean climate, with cool, rainy winters, and hot, dry summers. Snow is definitely rare, in fact the few snowfalls occurred are remembered as true events, in particular the one happened in February 1956. Despite this Naples has an annual average rainfall of 1007 mm, which is higher than that of Milan and London, also its rainfalls are usually concentrated in few days during the autumn (the city has 250 sunny days every year). The prevailing wind is the libeccio, coming in from the sea in the south-west. 1 Info Turismo Napoli, Via San Giuseppe dei Nudi, 82 (Museo 1 2 ), ☎ +39 380 145 1379, toll-free: +39 800 134 034, fax: +39 081 447 264, e-mail: ufficiocomunicazione@infoturismonapoli.com. 08:30-20:00. The main tourist information point in the historic centre, few steps from the National Archaeological Museum, with an helpful multilingual staff. The most widely spoken language in Naples is Italian, or a mixture of Italian and Neapolitan (Napulitano). The Neapolitan language - notoriously unintelligible to many speakers of standard Italian - also bears witness to the town's diverse cultural origins, being composed of French, Spanish and Arabic words, inserted into a Greek, Oscan and Latin structure. Neapolitan is sometimes described as an Italian dialect, but it is recognized by UNESCO as a distinct language. It has well-defined roots and rules, and there is a great heritage of literature (e.g. Giambattista Basile's Lo cunto de li cunti, a collection of fairy tales) and songs ('O sole mio and Torna a Surriento are some iconic examples). Neapolitan is still thriving in Campania and adjacent parts of Lazio, Abruzzo, Apulia, Basilicata, Calabria and Molise. The official language of Naples (as of all of Italy), however, is Italian, and everyone can speak it when prompted, though often with a strong local accent. Neapolitan has strong Spanish and French influences originating from periods of Spanish and French rule. Therefore, more Spanish and French words are understood by the locals than in other parts of Italy. English is the most commonly spoken foreign language, although the average knowledge of English is far from excellent. 1 Naples International Airport (Aeroporto Internazionale di Napoli) (NAP IATA, also known as Capodichino Airport). Works for connecting the airport to Naples Metro system are expected to be completed in 2020, but it is not yet served by any rail system. From the airport you can take a bus for €5 (called Alibus) which has two stops only: Stazione Centrale (Central station) and Piazza Municipio, near the main ferry port (molo Beverello). You can buy your ticket on the bus. The ticket is valid for further public transport trips, up to 90m after validation. Further connections are listed on the official airport website. If you have time to spare, you can take the 3S bus that will take you to the same stops as the Alibus for less. The difference is that the Alibus has limited stops, but the 3S will take you to the backstreets leading to the Stazione, continuing all the way to the port and a shopping district. Also, the Alibus is air conditioned whereas most 3S buses are not. Beware of illegal, unauthorized taxis and of anyone who may approach you directly. Authorized taxis are clearly visible at the exit; fixed fares exist for a number of destinations, and must be clearly shown in the cab. Make sure they are authorized before getting in the cab, and threaten to call the police ("polizia") should the taxi driver try to push back. The main station in Naples is 2 Napoli Centrale 1 2 , situated at Garibaldi square and connected to the city's subway system. It's a rather large area with multiple substations (platform groups). Plan 10 minutes reserve if you go there for the first time, so that you find your train in time. Under the same roof, a few hundred meters south-east, there's the Piazza Garibaldi station - here you can catch local and regional Circumvesuviana trains. West of the main station platforms, and few escalators down, is the entrance to subway Line 1. Some of the trains (e.g. towards Caserta) also share the platforms with Line 2. The entrances/substations for the individual lines are signposted visibly. However, the info tables at the substations only show the lines departing from the local platforms. So if you are at the wrong substation, you won't see your train time/platform info at the tables - and need to continue searching. From around the station, the bus routes Alibus, R2 and 151, the tram route 1 and the metro Line 1 will take you within three blocks of the ferries at Stazione Marittima. A massive new high-speed railway hub, 3 Napoli Afragola, has been built about 12 km north of the city centre. Some high speed trains running between Rome and points south of Naples will bypass the city centre and only use this station. Local trains call here as well, meaning that central Naples is just an easy interchange away if yourself arriving here. Other stations include Napoli Mergellina, a magnificent Art Déco building and Napoli Campi Flegrei. Prices of trains to and from Rome vary a lot, starting from €9.90 for commuter regional trains and €19.90 for Frecciarossa high-speed trains. Check the site of Trenitalia from more info. Cruise ships dock at 4 Stazione Marittima , a large terminal in the city center, near Piazza Municipio. MedMar Group operates several large ferry/passenger ships that connect Naples with Sardinia (Olbia), Corsica (Porto-Vecchio), Tunisia (Tunis), and the Aeolian Islands. These trips usually leave in the late afternoon or evening and arrive at their destination the next morning. Naples is directly connected with Rome by the motorway, and the trip takes generally less than 2 hours. The motorway, instead, links the city to Salerno through Ercolano and Pompeii. The other major road is the , connecting Naples to the Adriatic coast of northern Apulia. Due to traffic jams and parking shortages in the city center, it's advisable to leave your car in a parking lot near the motorway exit or your accommodation, and to use public transportation to visit the city. Many national and international private bus services operate in Naples, generally stopping at Piazza Garibaldi or Piazza Municipio. A new 5 bus terminal 2 has been created south of the central railway station, where 42 different bus companies stop their means of transport. Some of these provide links also from northern and eastern Europe. Traffic in Naples can be extremely heavy, similar to that of other big cities like Paris and New York. Extensive excavation works are ongoing to complete some metro segments, adding further to traffic in some areas. A typical example is the train station area, which is undergoing a complete makeover (a model of how it will look is observable in the interior of Stazione Centrale), plus the excavation of a metro line connecting it with Capodichino Airport. Another example is Piazza Nicola Amore (commonly known as Piazza Quattro Palazzi because of the four twin buildings surrounding it), where metro line excavations revealed an ancient Roman temple, whose structure will be integrated in the futuristic station designed by the world-class architect Renzo Piano. Normal traffic regulations are generally observed in Naples; however, it is prudent to follow the locals when crossing the street. Since pedestrians often cross the street in the middle of the block, Neapolitan drivers are very attentive, and accidents are very rare. Remember to always look left (and not right) for incoming cars or motorbikes, since circulation follows European standards. Taxis and the Metro are the quickest ways to see Naples. Taxis are the most expensive way, though. Before getting into a taxi, make sure it is licensed. Licensed taxis will have a city crest on the door and a taxi number. Also, make sure it has a meter. By law, licensed taxis must display a list of set fares in a number of languages (Italian, English, French, German, Spanish). Check for such fares and agree to them before starting the journey. You will be surprised how easily you can get around by foot, too. Interesting spots are almost on every corner and most distances – especially in the (historic) centre – are small and can be walked in a matter of minutes. Naples' public transportation system is fairly difficult to understand for the first time visitor, since different lines are operated by different companies and sometimes interexchange is not allowed between different providers. Nevertheless, the creation of the organization UnicoCampania with the aim of managing an integrated fare system for the whole region of Campania, has seen a real simplification of the tarifs. Within city limits, integrated tickets are available for use on any kind of vehicle and company. They exist at the price of €1.60 for one hour of validity, and €4.50 for a day. Besides, a Corsa Semplice ticket, valid for one ride in only one transport company, is available at the fare €1.10. Tickets can be bought at any authorized selling point. A very common place to find them away from railway or Metro stations is tobacco shops (Tabaccheria, easily identified by a big white "T" on a rectangular black field) or newspaper shops. They are not sold onboard the trains or buses. Passengers are randomly checked for having a ticket by authorized personnel. Not having a ticket results into a huge fine, with no exceptions, since in Italy this act is a tax offense. Metropolitana di Napoli. There are three lines of underground subway in Naples. They are always monitored by cameras and security officers, which both protects passengers, and deters them from marking graffiti or otherwise behaving uncivilly. Line 1 , managed by Azienda Napoletana di Mobilità (ANM), connects the city center to the hill quarters, like Vomero and the hospitals area. Avoid passing through Piscinola and Secondigliano as those areas can be very dodgy and dangerous. Line 2 , actually a commuter rail service operated by Trenitalia, crosses the city from west to east and have 10 stations within city limits. At Garibaldi, Cavour-Museo and Mergellina, it connects to subway lines. The tracks are shared with regional rail services of Trenitalia to Caserta, Castellammare di Stabia, Salerno and Pozzuoli. Line 6 , also managed by ANM, is a light subway connecting Fuorigrotta to Mergellina. The line has only 4 stops, but there are plans to expand it to the port. Funicolare. ANM also operates the four cable cars lines Centrale Chiaia Mergellina Montesanto . The first one connects Via Toledo to the hilly neighborhood of Vomero, the second runs from the elegant area of Chiaia to Vomero, the third connects the coast of Mergellina to the hill of Posillipo while the last one runs from the historic centre to Vomero. Buses. ANM also operates all bus lines within Naples, most of which are circular. Naples suffers from a serious problem of traffic jams and usually buses are overcrowded, so try to avoid them if you can (except for evenings and weekends). Circumvesuviana . Founded in 1889, the former Circumvesuviana railway operates from its own terminal station of 6 Napoli Porta Nolana. All routes pass through the underground station Piazza Garibaldi (which connects to Napoli Centrale and city subway) before splitting into 6 branches to towns in the eastern part of the province. An interesting route goes from Naples to Sorrento in about one hour, with several stops in between, including Pompei Scavi (from where it is an easy foot walk to the main entrance to Pompeii ruins) and Ercolano (Herculaneum). A second route travels around the northern flanks of Mt. Vesuvius and on to Sarno. Other routes go to Acerra, Nola and Baiano. Cumana. This line operates from Napoli - Montesanto, the original end station of SEPSA. It follows the coastline to the west of the city for approximately 20 km before ending in Torregaveta (Bacoli). The line runs through the urban centres of Montesanto, Fuorigrotta, Bagnoli, Pozzuoli, Arco Felice, Baia and Fusaro, before reaching Torregaveta. Circumflegrea. It also starts in Napoli - Montesanto and ends in Torregaveta. However, it runs further inland than the Cumana line, along the districts of Soccavo, Pianura, Quarto Flegreo, Licola and Cuma. It is approximately 7 km longer than the Cumana. Because both lines start and end in the same terminal stations, users can quickly transfer from one train to the other and complete an interesting tourist loop though the Phlegraean Fields. Arcobaleno . The Rainbow Line, thus called because of the characteristic colors of its stations, also known as Linea Metropolitana EAV since the merger in 2012, starts from station Napoli - Piscinola, where it connects with Line 1 of the underground subway. It's a 10.5-km-long, totally underground journey, which connects the northern suburbs of Naples, passing though Mugnano, Giugliano and Aversa. The EAV website has more information on timings, routes and cost of tickets. In addition to the EAV trains, national railway company Trenitalia also operates regional trains to many destinations in the province: Formia-Castellamare, Naples-Capua and Naples-Salerno. All these services share the railway of Metro Line 2 when crossing the city. Metrò del Mare has several lines that connect Naples and Sapri; Bacoli and Salerno and Sorrento; Monte di Procida and Salerno; and, Amalfi and Sapri. Besides the main stops the ferry service also connects many smaller communities. The Metro del Mare webpage has schedules, timetables and location of ticket counters. It seems to only operate in summer. MedMar, Caremar and SNAV operate hydrofoils and ferries. Reaching one of the islands in the gulf by ferry can take up to 70 minutes (hydrofoils are much faster, but more expensive). For most of the year, the sea is calm, and in any case when it happens to be rough the boats' runs are stopped. In any case, it is advised to follow the normal measures for sea travel. In particular, if you are sensible to the rolling of the ships, or travel with young children, consider taking an appropriate medication. Ferries also have open decks, which are particularly attractive and scenic to use in spring and summer. The sunlight is bright here, so cover up or use sunscreen to prevent sunburns. 1 Cappella Sansevero. A chapel built in 1590, it contains sculptures and other works of art by some of the leading Italian artists of the 18th century, like the extraordinary Veiled Christ by Giuseppe Sanmartino. It also has a high scientific interest because it hosts the anatomical machines, a still mysterious experiment by Raimondo Di Sangro, a prominent Renaissance scientist. In addition, in the basement there are two human vein models, looking like plastination. Because of the small size, the waiting queue may be longer than at other attractions in Naples. €9 (reductions available). 2 San Francesco di Paola (Municipio 1 ). One of the main churches in Naples, it's at the west side of Piazza del Plebiscito, the city's main square. The place was planned by King Joachim Murat of Naples (Napoleon's brother-in-law) as a tribute to the emperor. When Napoleon was dispatched, Ferdinand I of Bourbon continued the construction but converted the final product into the church one sees today. The church is reminiscent of the Pantheon in Rome. The façade is fronted by a portico resting on six columns and two Ionic pillars. Inside, the church is circular with two side chapels. The dome is 53 metres high. 3 Gesù Nuovo, Piazza Gesù Nuovo (Dante 1 ), ☎ +39 081 557 8151. M-F 07:00-12:30 and 16:00-19:45. The Church of Gesù Nuovo (New Jesus) was built in 1470 as a palace for Roberto Sanseverino, Prince of Salerno. The Jesuits had already built a church in Naples, now called Gesú Vecchio. Political intrigues caused the property to be confiscated, and eventually sold in the 1580s to the Jesuits to construct a church (1584–1601) under architect Giuseppe Valeriano. The unusual façade, unusually plain for a Baroque style church, is of rusticated ashlar and is the original façade of the palace. The church contains masterpieces of some of the most notable Neapolitan artists, namely Belisario Corenzio, Paolo de Matteis, Francesco Solimena, Giovanni Lanfranco and Massimo Stanzione. 4 San Domenico Maggiore, Piazza S. Domenico Maggiore, 8A, ☎ +39 081 459 188. 10:00-19:00. One of the most prominent churches of Naples. This Gothic church (est. 1283) incorporates a smaller, original church built on this site in the 10th century, San Michele Arcangelo a Morfisa. The monastery annexed to the church has been the home of prominent names in the history of religion and philosophy. It was the original seat of the University of Naples, where Thomas Aquinas, a former monk at San Domenico Maggiore, returned to teach theology in 1272. As well, the philosopher monk, Giordano Bruno, lived here. The sacristy houses a series of 45 sepulchres of members of the royal Aragonese family, including that of King Ferdinand I. Church: free, monastery: variable. 5 Santa Chiara, Via Santa Chiara, 49 (Dante 1 ; facing Gesù Nuovo), ☎ +39 081 797 1224, e-mail: amministraziones.chiara@gmail.com. M-F 09:30-17:30, Sa Su 10:00-14:30. A religious complex which includes the Church of Santa Chiara, a monastery, tombs, and an archaeological museum. The double monastic complex was built in 1313-1340 by Queen Sancha of Majorca and her husband King Robert of Naples. The original church was in traditional Provençal-Gothic style, but was decorated in the 1744 century in Baroque style by Domenico Antonio Vaccaro. Santa Chiara was the largest Clarissan church ever built, and it was the first Clarissan church built where the nuns in their choir would have been able to view the performance of Mass. The bell tower, separated from the main edifice, was begun in 1328 but was completed only in Renaissance times. The simple interior houses the tomb of King Robert and, in the side chapels, those of the Bourbon king of Naples, Francis II and his consort Maria Sophie of Bavaria, as well as of Queen Maria Christina of Savoy and of the national hero Salvo d'Acquisto (a carabiniere who sacrificed his own life to save the lives of 22 civilian hostages at the time of the Nazi occupation). Famous is the cloister of the Clarisses, transformed in 1742 by Vaccaro with the addition of precious majolica tiles in Rococò style. The Nuns' Choir houses fragments of frescoes by Giotto. 6 Naples Cathedral (Duomo di Napoli, Cattedrale di Santa Maria Assunta or Cattedrale di San Gennaro). Built in the 18th century, it is the main church of Naples. It is widely known as the Cattedrale di San Gennaro, in honour of Saint Januarius, the city's patron saint. It was built on the foundations of two palaeo-Christian basilicas, whose traces can still be clearly seen. Underneath the building, excavations have revealed Greek and Roman artifacts. The Cathedral is famous for Miracle of the Blood, a recurring miracle taking place on the first Saturday of May and September 19th every year. During the ritual an ampull containing the old dried out blood of Saint Januarius is brought out and stirred; and miraculously liquefies. According to legend, disaster will befall Naples if the blood fails to liquefy. 7 San Gregorio Armeno, Via San Gregorio Armeno, 1, ☎ +39 081 552 0186. M-Sa 09:00-12:00, Su 09:00-13:00. The church was completed in 1640, in honor of Saint Gregory of Armenia and it represents, along with the adjacent monastery, one of the most relevant Baroque complexes in Naples. The interior is decorated with 52 frescoes by Luca Giordano, and it is characterized by a single nave with five side arcades and chapels, in an impressive triumph of Baroque decorations. Free. 8 Santa Maria del Carmine Maggiore, Piazza del Carmine, 2, ☎ +39 081 201 196, e-mail: info@santuariocarminemaggiore.it. One of Naples' main churches, related to important historical events of the city and its kingdom, such as Masaniello revolt and the executions happened during the five months existence of Parthenopean Republic (1799). The interior is a true triumph of Baroque decorations including polychrome marbles, stuccoes and a magnificent gilded ceiling. The basilica is located in Piazza del Carmine, few steps away from Piazza Mercato and Via Marina and it's recognizable by the 75 metres high bell tower, with a characteristic onion dome. Free. 9 Castel dell'Ovo (Egg Castle), Via Eldorado, 3, ☎ +39 081 795 4592, e-mail: casteldellovo@comune.napoli.it. M-Sa 09:00-18:30, Su 09:00-14:00. The oldest castle of the city, located on the former island of Megaride, now a peninsula, on the Gulf of Naples. The castle's name comes from a legend that the Roman poet Virgil (who had a reputation in medieval times as a great sorcerer) put a magical egg into the foundations to support them. The island of Megaride was where Greek colonists from Cumae founded the nucleus of the city (Palepolis) in the 6th century BC. In the 1st century BC the Roman patrician Lucius Licinius Lucullus built the magnificent villa Castellum Lucullanum on the site. The first castle on the site was built by the Normans in the 12th century. Free entry. 10 Castel Nuovo (New Castle), Via Vittorio Emanuele III (Municipio 1 ), ☎ +39 081 795 7709. M-Sa 08:30-19:00. Often called Maschio Angioino, it is a medieval castle and the main symbol of the architecture of the city. It was first begun in 1279 by Charles I of Anjou and completed three years later. Castel Nuovo soon became the nucleus of the historical center of the city, and was often the site of famous events. For example, in 1294, Pope Celestine V resigned from the Papacy in a hall of the castle. The event was depicted by Dante Alighieri in his masterpiece la Divina Commedia, in the verse Colui che per viltade fece il gran rifiuto. 11 Castel Capuano, Piazza Enrico de Nicola, 2, ☎ +39 081 223 7262. 09:00-18:30. The second most ancient castle of Naples after Castel dell'Ovo, built in 12th century by the Normans over a necropolis for use as a royal palace. It was then used as a residence for distinguished visitors such as Francesco Petrarca, and also as site for royal weddings and ceremonies. In 1503 it became the seat of city's courthouse for almost half a millennium, until the year 1995. Its name derives from its proximity to the road that led to Capua. 12 Castel Sant'Elmo (Morghen Centrale , then a five minutes walk). A huge, imposing hilltop medieval fortress, providing outlooks to the surrounding city and hosting a small art gallery. 13 Certosa e Museo di San Martino (adjacent to the castle). A former monastery complex, now a museum. It is the most visible landmark of the city, perched atop the Vomero hill that commands the gulf. A Carthusian monastery, it was finished and inaugurated under the rule of Queen Joan I in 1368. In 1623, it was further expanded and became, under the direction of architect Cosimo Fanzago, essentially the structure one sees today. In the early 19th century, under French rule the monastery was closed and was abandoned by the religious order. 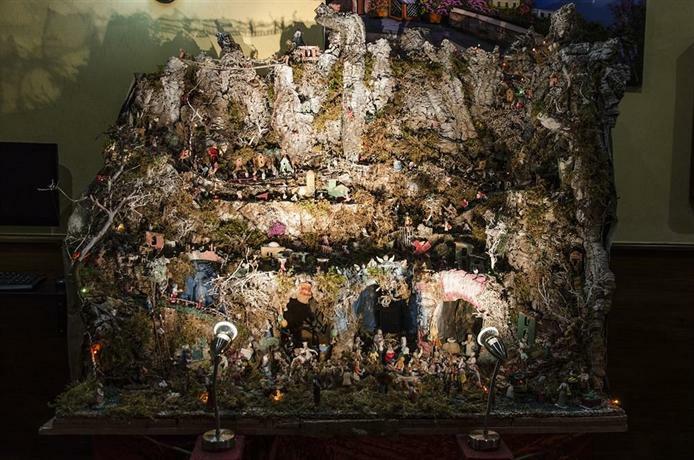 Today, the buildings house a museum with a display of Spanish and Bourbon era artifacts, as well as displays of the presepe (Nativity scene) considered to be among the finest in the world. 14 Villa Floridiana and Museo Nazionale della ceramica Duca di Martina (bus 128 to "Falcone"). A large, quiet park with beautiful panoramic views, surrounds a neoclassical villa which hosts a large ceramic collection from different parts of the world. 15 Villa Pignatelli (Parco Margherita Chiaia , then walk a few blocks.). A former luxurious residence and a small park. Also a quite interesting museum of horse carriage vehicles and other horse equipment. 16 Posillipo (Mergellina 2 6 ; then walk downhill to Via Mergellina and take bus 140). (Pusìlleco in Neapolitan) A district of Naples on the northwestern part of the town. The Greeks first named this place Pausílypon (meaning "respite from worry") due to the enchanting calm of the shore. There are Roman ruins at water's edge, remains of the residence of Vedius Pollio. The area contains some notable historical buildings and landmarks. Among these is the Palazzo Donn'Anna and Villa Rosebery, the Italian President's residence during his stays in Naples. 17 Galleria Umberto I (Municipio 1 ). A public shopping gallery that is directly across from the San Carlo opera house. It was designed by Emanuele Rocco, who employed modern architectural elements reminiscent of the Galleria Vittorio Emanuele II in Milan. The Galleria was meant to combine businesses, shops, cafes and social life — public space — with private space in the apartments on the third floor. Subterranean archeological excavations are a quite popular sight, with not too distinctive names. 18 Napoli Sotteranea. Shows former stone quarries, used the city buildings, transformed later to water distribution network, garbage disposal pits and finally a war shelter. You will visit several larger and smaller areas connected by narrow paths - beware if you are claustrophobic! In addition, the tour shows remains of the nearby Greco-Roman theatre, where Nero (supposedly) made his artistic debut. 19 Neapolis Sotterrata. Presents ruins of a former Roman market - shops and the like. In addition, entrance to the surrounding museum and chapels is included. 20 Napoli sotterranea (Bar Gambrinus at Trieste e Trento square.). Shows the labyrinth of tunnels, tanks and cavities and takes about 1 hr. 21 Galleria Borbonica, Vico del Grottone, 4/Via D. Morelli, 61, ☎ +39 081 764 5808, e-mail: mail@galleriaborbonica.com. A tour of an old tunnel that connects the palace to military barracks, used as a bomb shelter in World War II. Unique early Christian underground cemeteries (catacombs) behind the former city walls are near the Capodimonte - they are completely different, but both quite interesting. One entrance (€9) is valid for both (for up to a year). 22 Catacombe di San Gennaro (Take bus to Capodimonte e.g. from Museo.). M-Sa 10:00-17:00 (last admission), Su 10:00-14:00. An extensive, two floor catacombs area restored and maintained by a few dozen local-patriots. Misc. tombs, frescoes, mosaics, etc., are shown. 23 Catacombe di San Gaudioso (On the way to San Gennaro, jump off at the bridge and take elevator in the middle of it. Also possible to exit right from the San Gennaro chapel and walk down the street.). 10:00-13:00 (last admission). A catacombe area where macabre ritual of "draining" was performed. A few remains of skulls in the walls, parts of skeletons and wall paintings are shown. Also the history of the "upstairs" church is shortly showcased. 24 Tomb of Virgil, Parco Vergiliano (Mergellina 2 ). One of the greatest Latin poets, author of the Aeneid. Metro stations. All (or most) stations contain some works of contemporary art from many artists - and/or striking architecture. Among the most interesting ones are Universitá, Toledo and Salvator Rosa. The metro buildings won the prize for the "Most Innovative Approach to Station Development" at Metros 2009, and in 2012, the Toledo 1 station was elected as the "Europe's most impressive" by the British newspaper The Daily Telegraph for its remarkable artistic value. 25 Porta Capuana, Piazza Enrico de Nicola (in front of Castel Capuano). Ancient city gate built in 1484, during the Aragonese rule, it represents one of the few visible remains of the medieval walls of Naples. It consists of an arch of white marble decorated with various bas-reliefs, between two impressing cylindrical towers made of igneous rock. During the first half of 20th century the square around the gate was a meeting point for artists and intellectuals. 26 Fontana del Gigante (Fountain of the Giant), Via Partenope (promenade corner). One of the most beautiful fountains of the city, made in the beginning of 17th century by Pietro Bernini, father of the more famous Gian Lorenzo. It was originally located beside the Royal Palace, close to the statue of a giant and then moved on the promenade. It is composed of three round arches topped by coat of arms and decorated by various statues. 27 Naples National Archeological Museum (MANN), Piazza Museo, 19 (Museo 1 2 , Cavour 2 ), ☎ +39 081 442 2149. W-M 09:00-19:30. The most important Italian archaeological museum about Roman civilization, it contains a large collection of Roman artifacts from Pompeii, Stabiae and Herculaneum. The collection includes works of the highest quality produced in Greek, Roman and Renaissance times. €13, free on the first Sunday of month. 28 Royal Palace and National Museum of Capodimonte, Via Miano, 2, ☎ +39 81 749 9111. 08:30-19:30. Hosts paintings from the 13th to 18th centuries, including major works by Simone Martini, Raphael, Titian, Caravaggio, Masaccio, Sandro Botticelli, Lorenzo Lotto, Giovanni Bellini, Giorgio Vasari, El Greco, Jacob Philipp Hackert. It also hosts the works of the most important Neapolitan painters, like Jusepe de Ribera, Luca Giordano, the Neapolitan Caravaggisti. €7.50, €6.50 after 14:00. 29 Museum of Contemporary Art Donnaregina (MADRE), Via Luigi Settembrini, 79 (Cavour 2 ), ☎ +39 081 197 37254, e-mail: info@madrenapoli.it. M W-Sa 10:00-19:30, Su 10:00-20:00. Very nice museum for contemporary art, with a permanent collection and temporary exhibitions. €7, free entry on Mondays. 30 Museo Civico Filangieri, Via Duomo, 288. Large collection of artworks, coins, and books donated to the city by Prince Gaetano Filangieri. 31 Complesso monumentale dei Girolamini, Via Duomo, 142. Ecclesiastic complex comprising a a gallery of paintings, a cloister, a library of thousands of ancient manuscripts, and a baroque church. €5 with reductions, free on first Sunday of the month. 32 Palazzo delle Arti (PAN), Via dei Mille, 60 (Piazza Amedeo 2 ), ☎ +39 081 795 8651, e-mail: pan@comune.napoli.it. M W-Sa 09:30-19:30, Su 09:30-14:30. A civic museum born as a public exhibition center for the civic collections of arts, and to host art and culture events organized by the City of Naples. Free entry. 33 National railway Museum of Pietrarsa (Museo nazionale ferroviario di Pietrarsa), Via Pietrarsa (Pietrarsa-S. Giorgio a Cremano FS station), ☎ +39 081 472 003, e-mail: museopietrarsa@fondazionefs.it. A museum housed in the ancient 19th century's Bourbon Factories, along the route of the first railway in Italy: the Napoli-Portici line. Here is possible to admire a large variety of rolling stock like steam locomotives and different periods' carriages. 34 Museo Universitario delle Scienze e delle Arti (MUSA), Via Luciano Armanni, 5 (Cavour 2 ), ☎ +39 081 566 7747, e-mail: musa@unicampania.it. Tu-F 10:00-13:00. One of the most ancient Anatomy museums of Europe, located in the religious complex of Santa Patrizia, where is possible to discover this fascinating context in the sections of anatomy, pharmacology, stomatology, bibliography and art. You will be guided thanks to the official app for mobile. 35 Royal Palace (Palazzo Reale), Piazza del Plebiscito (Municipio 1 ), ☎ +39 081 580 8111, e-mail: pm-cam.palazzoreale-na@beniculturali.it. Tu-Su 09:00-20:00. One of the four residences used by the Bourbon Kings of Naples during their rule of the Kingdom of Two Sicilies (1730-1860). The Royal Palace is on the site of an earlier building meant to host King Philip III of Spain, who however never made the trip. The architect chosen for that palace was Domenico Fontana. The building was put up on the site of an even older Spanish viceroyal residence from the early 16th century. The 17th-century palace visible today is the result of numerous additions and changes, including some by Luigi Vanvitelli in the mid-18th century and then by Gaetano Genovese. 36 Albergo dei Poveri (Bourbon Hospice for the Poor), Piazza Carlo III. M-F 09:00-22:00, Sa 09:00-13:00. A former public hospital/almshouse. It was designed by the architect Ferdinando Fuga, and construction was started in 1751. It is five storeys tall and about 300 m long. It was popularly known as "Palazzo Fuga". King Charles III of the House of Bourbon meant the facility to house the destitute and ill, as well as to provide a self-sufficient community where the poor would live and work. The building was designed with five courtyards and a church in the centre, but only the three innermost courtyards were built, and plans to complete the building according to the original design were finally abandoned in 1819. It is no longer a hospital, and has suffered much from neglect and earthquakes. The centre behind the entrance is now used for exhibitions, conferences, and concerts. 37 Palazzo dello Spagnolo (Palace of the Spaniard), Via Vergini, 19 (Cavour 2 ). A late-baroque palace built in 1738 in Rione Sanità, famous for its monumental courtyard staircases with arches in shifting places. 38 Palazzo Zevallos (Palazzo Colonna di Stigliano), Via Toledo, 185 (Municipio 1 ), toll-free: +39 800 454 229, e-mail: info@palazzozevallos.com. Tu-F 10:00-18:00, Sa Su 10:00-20:00. Elegant palace built in 1639 by the noble Spanish family Zevallos. It houses a rich art gallery comprising sculptures and paintings from 17th to 19th century, some of them realized by artists of the School of Posillipo. €12 full; €3 reduced. 39 Palazzo di Sangro di Casacalenda, Piazza San Domenico Maggiore. 09:00-18:00. 3-stores palace built during the second half of 18th century by the architect Mario Gioffredo. The internal courtyard was designed by Luigi Vanvitelli and features a four-arch portico and Doric order lesenes. Enjoy classical music in the Neapolitan temple of opera, or other performances such as musicals, comedies and actors' exhibitions in one the theatres in the historic centre. 1 Real Teatro San Carlo (Royal Theatre of Saint Charles), Via San Carlo, 98/F (Municipio 1 ; beside the Royal Palace. ), ☎ +39 081 797 2331, e-mail: biglietteria@teatrosancarlo.it. M-Sa 10:00-17:30, Su 10:00-14:00. Founded in 1737, is the oldest continuously active opera house in Europe. In the 18th century, Naples was the capital of European music, and even foreign composers like Hasse, Haydn, Johann Christian Bach and Gluck considered the performance of their compositions at the San Carlo theatre as the goal of their career. Two main Italian opera composers, Gioacchino Rossini and Gaetano Donizetti, were artistic directors of the San Carlo for many years. Other prominent opera composers, like Vincenzo Bellini, Giuseppe Verdi, Giacomo Puccini, Pietro Mascagni, and Leoncavallo, staged here the very first productions of their works (like for example the famous Lucia di Lammermoor by Donizetti). 2 Teatro Bellini (Bellini Theatre), Via Conte di Ruvo, 14 (Museo 1 2 ; two blocks south of National Archaeological Museum), ☎ +39 081 549 1266, e-mail: botteghino@teatrobellini.it. 10:30-13:30, 16:00-19:00. Built in 1878 and named after the Sicilian composer Vincenzo Bellini, the Bellini Theatre hosted prestigious events such as operas for almost a century. In 1960s a period of decline started for the structure, that became a sort of cheap movie cinema, away from the splendor of its origins. In 1986 the theatre was restored and reopened two years later, starting a lucky phase that lasts even today. 3 Teatro Augusteo, Piazzetta Duca d'Aosta (Augusteo Centrale ; in front of Galleria Umberto I), ☎ +39 081 414 243, e-mail: botteghinoaugusteo@libero.it. A theatre designed by Pier Luigi Nervi in 1929 and built inside a 18th-century noble palace, along the central Via Toledo. The structure was closed during World War II and reopened during 1950s as a cinema, until it was finally restored in 1992 to resume its status of elegant theatre. It now has a seating capacity of 1,420 and hosted the performances of famous actors and musicians like Bruce Springsteen. From €34.5 to €46. 4 Underwater Park of Gaiola (Parco Sommerso di Gaiola), Discesa Gaiola, ☎ +39 081 240 3235, e-mail: info@areamarinaprotettagaiola.it. winter daily 10:00-14:00, summer Tu-Su 10:00-16:00. Diving, snorkeling or trip on glass-bottomed boat "Aquavision" in the marine protected area of the minor island of Gaiola, off Posillipo elegant quarter. Just choose your favorite way to discover this stretch of coastline and the surprising abundance of colored marine life beneath the limpid waters of the Gulf. Various options are available on the official site. Centro Sub Campi Flegrei, info@centrosubcampiflegrei.it. A 5*IDC diving centre offering diving and snorkelling in the Gulf of Naples, around the Phlegraean islands and within the underwater Archaeological Park of Baiae (the so-called submerged Pompeii!) Open all year. 5 accordi @ Disaccordi Open Air Cinema Festival (info@accordiedisaccordi.com), Viale del Poggio di Capodimonte, ☎ +39 081 549 1838. 21:10. If you are in Naples during summertime, don't miss the chance to experience the cinema beneath the stars on warm nights, in an amphiteatre equipped with one of the widest projection screens in Italy which rises having an artificial lake all around. These events really make people revive the movies each night of the festival! €4 per day. 6 Pontile di Bagnoli, Via Coroglio, 28-30 (Bagnoli Cumana ). 08:00-19:00. A walk of 900 m (½ mile) suspended on the waters of the Gulf of Pozzuoli, along a concrete pier built in 1962 to serve a former steel mill, closed in 1993 and now dismantled. Enjoy a relaxing stroll surrounded by the stunning view of Cape Miseno and the islands of Nisida, Ischia and Procida. Free. Walk from Piazza del Plebiscito to Castel dell'Ovo along the balcony of 7 Via Cesario Console and enjoy the view over the Royal Palace, cruise ships docked, Mount Vesuvius and the Sorrento peninsula. Step away from the chaotic downtown and walk along the paths of 8 Villa Comunale, a large public garden in front of the long promenade of 9 Via Caracciolo, decorated with statues and fountains, and surrounded by palms, stone pines and lime trees. 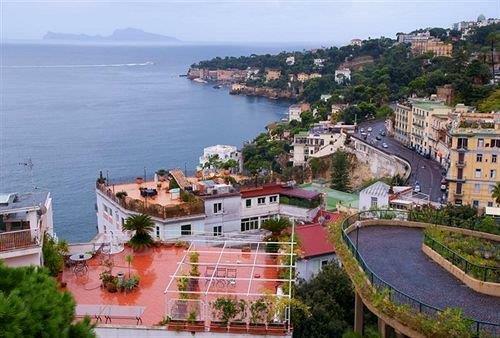 Take the C31 or 140 bus and reach 10 Parco Virgiliano, a panoramic public garden in Posillipo with a truly stunning view. Watch football ie soccer at SSC Napoli, who play in Serie A, the top tier of Italian football. Their home ground is Stadio San Paulo, capacity 60,000, 5 km west of city centre: take metro to Cavalleggeri Aosta. Naples has vibrant markets and many small shops that sell everything from clothes to household appliances at prices much lower than in most of Western Europe. Especially to be seen is the 1 Porta Nolana, 2 Pignasecca and the Vasto markets, which also give a grasp of popular Neapolitan life. Don't miss the impromptu fish market which happens especially on Sunday morning at 3 Rotonda Diaz, the central square of Via Caracciolo. Small fishing boats come ashore, and directly sell fresh and often alive fish and octopuses, a very characteristic and joyful scene of Naples' life. Via Chiaia and Via Toledo are two major shopping streets near the city centre. Spaccanapoli in the Centro Storico is packed with street vendors and odd-shops. The small street Via Port'Alba, near Piazza Dante is home to a large number of bookstores. Do not buy any obviously fake items sold in the street, especially fake big fashion firms' products like purses, foulards, sunglasses and so on. A huge number of plainclothes police raid the streets to combat the trade in counterfeit products, and it's not only the sellers who get in trouble: according to Italian law, if you are caught buying one of these products, you risk being arrested and subjected to a huge fine. Also, do not buy electronic products like iPhones, iPads and cameras on the streets. Normally, the ones which illegal street vendors try to sell you are fakes - they show you a real one, and then made a quick switch through sleight of hand. Don't think you can outsmart these scammers. You will find many sauces based on garlic sauteed in extra-virgin olive oil, tomatoes, and local red wines. Some of the sauces are arrabbiata ("angry") or fra diavolo ("brother Devil"), which means they will contain hot pepper. It's a great cuisine. Enjoy! Fresh mozzarella di bufala (mozzarella made from European buffaloes' milk) is also typical of the region; don't miss the opportunity to taste it! While pizza is a traditional Neapolitan dish, it became ubiquitous in the Italian cuisine only in modern times. Look for pizza margherita, the original one, with tomato, basil and fresh mozzarella toppings. In Naples every pizzeria makes a decent pizza, and Neapolitans believe their pizza is the best in the world. Unlike pizza in places like the United States, Neapolitan pizza is generally very thin-crusted and saucy and is expected to be eaten as a whole pie while sitting down. 1 Da Michele, Via Cesare Sersale, 1-3, ☎ +39 081 553 9204. 11:00-22:30. There is usually a queue - get a numbered ticket from the waiter at the door when you arrive. The pizzas are cooked quickly, and they expect you to vacate seats just as quickly. 2 Pizzeria Brandi, Salita Sant'Anna di Palazzo, 1-2 (Chiaia Str. closer to Plebiscito Square), ☎ +39 081 416928. A stone tablet displayed outside the restaurant explains the history of the first pizza margherita, allegedly created here. 3 Pizzeria Starita, Via Materdei, 27 (Materdei 1 ), ☎ +39 081 557-3682. 12:00-03:00. Close to de-crowning Da Michele as the best pizzas in Naples. 4 Trianon da Ciro, Via Pietro Colletta, 44/46 (just in front of Da Michele). The pizzas are less soupy and with crispier crusts. 5 Di Matteo, Via dei Tribunali, 94, ☎ +39 081 455 262, e-mail: info@pizzeriadimatteo.com. 09:00-00:00. Il presidente, Sorbillo, and his sister, a few doors away (informally known as "la vecchia", the old lady, from the owner of the pizzeria, a very small place with only 4 or 5 tables, that looks like a pizzeria of 50 years ago - very hard to find, but it's worth it!) You can get pizzas to eat on the go. €1. Neapolitan cuisine in general features much seafood, befitting its status as an ancient and still functioning port. The most popular fish recipe is Polpo alla lucìana, consisting in octopus cooked in a terracotta pan with tomatoes, garlic, capers, pepper and black olives of Gaeta, served with chopped parsley. The name derives from the ancient fishing port of Borgo of Santa Lucia, now a tourist port close to Castel dell'Ovo. Other important traditional dishes are spaghetti alle vongole, acqua pazza, paccheri with fish soup and anchovies, prepared in various recipes or added on pizza. 6 Enotrattoria Casetta Rossa, Piazzale Carlo Pisacane (Pisacane alibus stop; Marina-Duomo bus stop), ☎ +39 081 207 690, e-mail: casettarossanapoli@libero.it. Su-Th 12:00-15:45, F Sa 12:00-15:45 and 20:00-22:30. Also if not very easy to reach it offers one of the best dishes of Mediterranean cuisine. 7 Pescheria Lo Squalo, Via Giustiniano, 273 (Piave Circumflegrea ), ☎ +39 331 832 4134. Tu-W 07:00-14:00, Th-Su 07:00-14:00 and 20:00-00:00. Excellent raw and cooked seafood of the Neapolitan tradition. 9 Gran Bar Riviera, Riviera di Chiaia, 181, ☎ +39 081 665 026. 06:00-22:00. Excellent sweet specialties, including zeppole, sfogliatelle and babà. 11 Pasticceria Scaturchio, Piazza San Domenico Maggiore, 19 (adjoining to Piazza del Gesù), ☎ +39 081 551 7031, e-mail: info@scaturchio.it. 08:00-21:00. 12 Sfogliatella Mary, Galleria Umberto I, 66 (entry from Via Toledo), ☎ +39 081 402 218. Tu-Su 11:00-20:30. A small pastry shop become a sort of "must-see" for tourists, due to the quality of its Neapolitan pastries, especially the sfogliatelle. 13 Drago d'Oro, Via Del Chiostro, 21/23 (behind the Post office building), ☎ +39 081 790 1016. M-F 12:20-23:00, Su 18:50-23:00. Asian cuisine in a cheap and informal Chinese restaurant close to Via Toledo. 14 Happy Rock Cafe, Via Giovanni Bausan, 51 (close to Villa Pignatelli), ☎ +39 081 411 712. Su-Th 19:30-00:30, F 19:30-01:30, Sa 19:30-02:30. Mexican and fusion cuisine in a mid-range pub specialized in fondue. 15 Honzen Japanese Restaurant, Via Alessandro Manzoni, 126 (Manzoni Mergellina ; C31 bus to "Manzoni"), ☎ +39 081 714 7201, e-mail: info@honzen.it. Tu-Tfh 20:00-00:00, F-Su 13:00-15:00 and 20:00-00:00. Excellent mid-range sushi restaurant in Posillipo district. 16 Neapolis, Via Giovanni Paladino, 22 (Università 1 ), ☎ +39 081 551 5584. M-F 12:00-15:00 and 20:00-00:00, Sa 20:00-01:00, Su 20:00-00:00. Typical Greek dishes in the old town founded by the Greeks. 17 Teranga Worldwide Pub, Vico Costantinopoli, 2/4 (Dante 1 ), ☎ +39 081 299 838, e-mail: ouangojudi@hotmail.com. Tu-Sa 18:30-05:00, Su 20:00-05:00. Superb African cuisine in a lively pub with music up late at night, in front of Piazza Bellini, the area of Neapolitan movida. 18 Zio Jack Griglieria, Via Palepoli, 6, ☎ +39 081 240 5151. M-Sa 20:00-00:00. Grill for all the carnivores, near the boardwalk in Santa Lucia. Naples is becoming increasingly popular with a younger generation of Italians and foreigners who flood into the city and lend renewed vitality to its nightlife. The hippest scene is around the bars and cafes on Piazza Bellini, Piazza Santa Maria la Nova and Piazza San Domenico Maggiore, becoming busy after 23:00. Also, Piazza San Pasquale and Mergellina are typical places for the local movida. If you want to venture to the outskirts of the city, there are many bars and clubs near the port and boardwalk of Pozzuoli. While Neapolitans (and Vigili Urbani, the town's local police) are largely tolerant to youngsters drinking, having fun and making noise, even at late hours, getting drunk and causing damage or littering is not tolerated. Neapolitan coffee is a true specialty, on a par with the world-famous pizza and starting the day drinking a cup of it represents a daily ritual. Preparing an authentic one requires the use of a particular flip coffee pot (locally called cuccumèlla) to obtain the typical intense flavor. Also if not all cafes and bars still use it, the quality of this extraordinary drink is excellent in almost every part of the city. 1 Gran Caffè Gambrinus, Via Chiaia, 1/2 (beside Piazza del Plebiscito and San Carlo Theatre), ☎ +39 081 41 7582, e-mail: info@grancaffegambrinus.com. 07:00-01:00. Enjoy the special Neapolitan coffee in one of the most prestigious and famous cafes in Italy. Founded in 1860 in the rear of Palazzo delle Prefettura, the cafe was also known for being a meeting site for intellectuals, artists and politicians. 2 Caffè Ciorfito, Via San Biagio dei Librai, 90, ☎ +39 081 203 161. M-Sa 06:00-20:00. Taste the authentic Neapolitan coffee and pastries in a welcoming cafe in the heart of the old town, usually visited by Italian actors. 3 Bar Mexico, Piazza Giuseppe Garibaldi, 72 (Garibaldi 1 ; Piazza Garibaldi 2 ), ☎ +39 081 283 121. 05:30-20:30. One of the best coffees you can enjoy in the city, just 50 metres away from central railway station. 4 Bar Salvo, Via Enrico Alvino, 73 (Vanvitelli 1 ), ☎ +39 081 556 3845. M-Sa 06:30-19:30. Great coffee and pastries in an informal cafe along a pedestrian area in the elegant Vomero quarter. 5 Enoteca Belledonne, Vico Belledonne a Chiaia, 18, ☎ +39 081 403 162, e-mail: info@enotecabelledonne.it. M 09:00-20:00, Tu-F 09:00-19:00, Sa Su 09:00-16:00. Taste the best Italian wines along with cheeses, hams, sausages and pastries in an elegant wine bar and shop in Chiaia district. 6 Il Mantegno, Piazzetta Nilo, 18, ☎ +39 081 215 8290. Tu-F 09:30-02:00, Sa Su 09:30-03:00. Great wines, cocktails, beer and appetizers in a small but nice wine bar in the historic centre. 7 Mosto (Birra&Distillati), Vico II Alabardieri, 28 (50 m from Piazza dei Martiri), ☎ +39 081 058 4703. M-Th 19:00-02:00, F-Su 19:00-03:00. Excellent selection of beer and cocktails in a beautiful pub with jazz music. 8 Spuzzulè Winebar, Via Sergente Maggiore, 54 (Municipio 1 ), ☎ +39 393 432 1139, e-mail: spuzzule@gmail.com. Tu-Su 18:00-00:00. Wide choice of wines accompanied by typical regional dishes. 9 Arenile di Bagnoli, Via Coroglio, 14/B (Bagnoli Cumana ), ☎ +39 081 570 6035. Beach club with pool and solarium by day, vibrant disco by night. Various live performances of international DJs. 10 Disco Mon Amour, Salita Arenella, 41 (Medaglie d'Oro 1 ), ☎ +39 340 531 9160, e-mail: vittorio.falco@facebook.com. W 22:00-03:00, F 23:00-03:30, Sa 23:00-04:30, Su 22:30-04:00. 11 Riva Club, Via Coroglio, 154 (bus 607, Bagnoli district), ☎ +39 333 640 9787, e-mail: rivasummerclub@gmail.com. Seaside disco with an elegant and modern atmosphere, located in front of the island of Nisida. 12 Virgilio Club, Via Tito Lucrezio Caro, 6 (bus 140 or C31), ☎ +39 081 575 5261. Live music and excellent drinks in the enchanting location of Posillipo, overlooking the bay. Accommodation in Naples is normally cheaper than in Rome or northern Italian cities for comparable quality, and a wide range of accommodations is available. Many budget accommodation options are around Piazza Garibaldi and the train station, but with care you can find reasonably priced accommodation in more pleasant areas of the city. 1 6 Small Rooms Hostel & Guesthouse, Via Diodato Lioy, 18 (Dante 1 ), ☎ +39 081 790 1378, e-mail: info@6smallrooms.com. 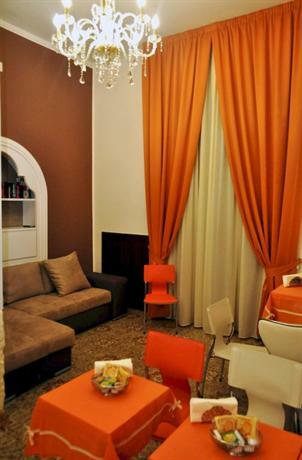 A great hostel with private rooms in the middle of the historical center of Naples. Clean, cozy and friendly. Cooking facilities, English speaking staff, DVDs, fridges, book exchange, tourist info and maps. It can be difficult to find, so keep their phone number in case you get lost. 2 Hostel Mancini Naples (hostel pensione mancini), Via Pasquale Stanislao Mancini, 33 (Garibaldi 1 ), ☎ +39 081 553 67 31, fax: +39 081 553 6731, e-mail: info@hostelmancininaples.com. Check-in: 24 hr, check-out: 10:00. Cheap hostel in front of the Central Railway Station in Naples City Centre. Free Wi-Fi and breakfast. Free kitchen for guest use. Beds from €15 and rooms from €35. 3 Bed and Breakfast La Bouganville, Via Alessandro Manzoni, 155, ☎ +39 081 769 2205, +39 338 222 7842 (Mob), e-mail: info@labouganville.com. 4 B&B Naples I Visconti, Via Pasquale Scura, 77 (Dante 1 ), ☎ +39 081 5529 124, e-mail: info@napolibandb.it. New rooms, comfortable, convenient to downtown Naples. Prices from €35 single use. Wi-fi and DVDs. 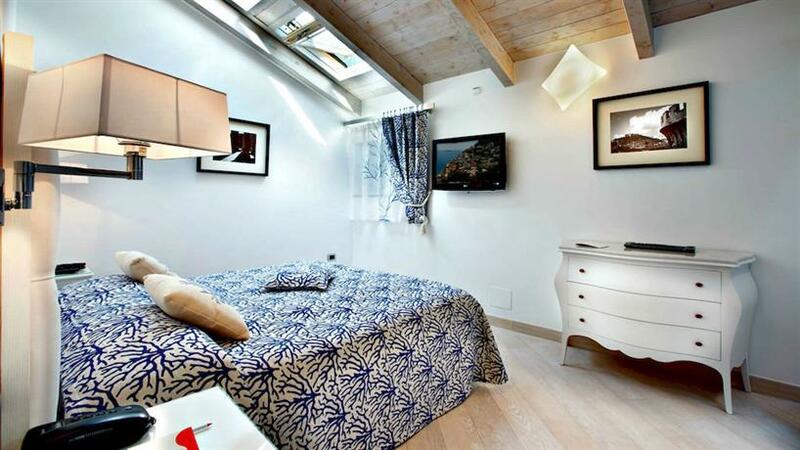 5 Dei Decumani bed & breakfast, Via Duomo, 187, ☎ +39 081 440 648, e-mail: mail@deidecumani.it. 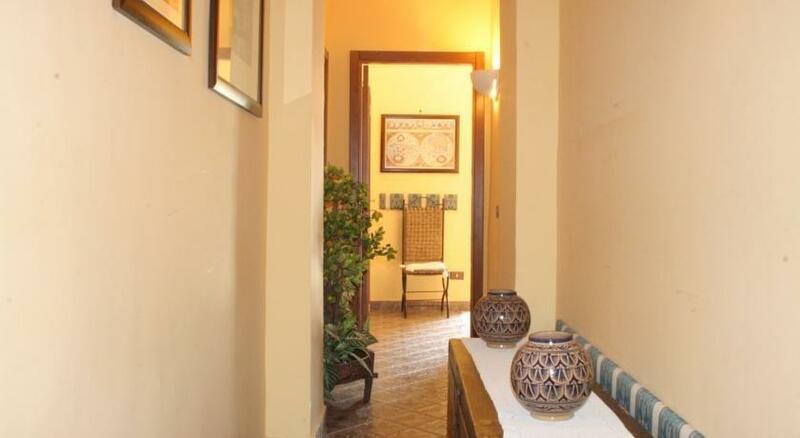 One of the best bed and breakfasts in Naples in the historic centre. 6 Hostel of the Sun, Via Guglielmo Melisurgo, 15 (Municipio 1 ), ☎ +39 081 420 6393, e-mail: info@hostelnapoli.com. Refurbished in 2015, and in the centre of town. Clean, friendly and close to the ferries. Open 24 hours. Good kitchen, breakfast included, knowledgeable and multi-lingual staff, DVDs, satellite TV, small library, free Internet, etc. Dorm bed €18, double €55, ensuite double €70, triple €80, ensuite €90, quadruple €90..
7 Hotel San Giorgio Napoli, Via Alessandro Poerio, 9 (Garibaldi 1 ), ☎ +39 081 281 661, e-mail: albergosangiorgio@inwind.com. Renovated 3-star. Central location but noisy. 8 Hotel Speranza, Via Palermo, 31 (Piazza Garibaldi 2 ), ☎ +39 081 269 286-99. Has seen better days and not in the best neighbourhood, but it's clean, cheap, and close to the train station. €45 for a double room with bath. 9 Potenza Hotel, Piazza Garibaldi, 120 (Garibaldi 1 ), ☎ +39 081 286 330, e-mail: info@hotelpotenza.com. Informal hotel near the central railway station. 10 Art Resort Galleria Umberto Napoli, Galleria Umberto I, 83, ☎ +39 081 497 6224, e-mail: booking@hotelgalleriaumberto.com. 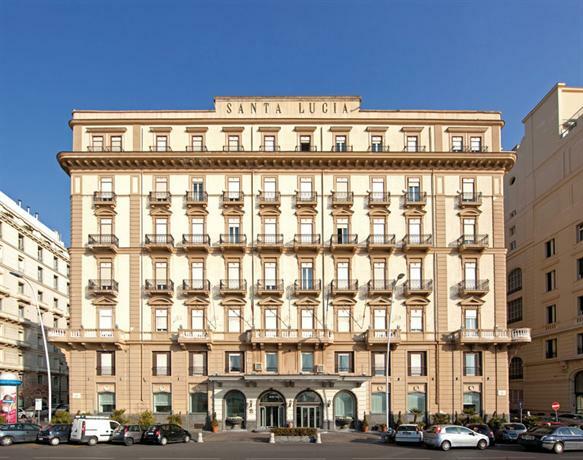 4-star hotel in the Galleria Umberto I, furnished with a patrician house style of the 19th century. Opened in 2015. 11 Capodichino International Hotel, Viale Comandante Umberto Maddalena, 35/37, ☎ +39 081 751 8786, e-mail: info@hotelcapodichino.it. A 19th-century farmhouse that was remodeled into a hotel in 2015. 5-min walking distance from Naples Airport, and there’s a minibus that comes around that will take you to Piazza del Municipio. 12 Caravaggio Hotel Napoli, Piazza Cardinale Sisto Riario Sforza, 157, ☎ +39 081 211 0066, e-mail: info@caravaggiohotel.it. 4-star hotel near the Cathedral, in front of the obelisk of St. Januarius. 14 Hotel Cavour, Piazza Giuseppe Garibaldi, 32 (Garibaldi 1 ), ☎ +39 081 283 122, e-mail: napoli@hotelbb.com. Comfortable three-star long-standing traditional hotel, renovated. Near the historical sites - Decumano Maggiore. Garage at 20 m, 93 rooms, 10 deluxe suites with air conditioned and minibar, all rooms with satellite TV, direct telephone dialing. Two restaurants serving delicious Neapolitan, regional and international dishes. 15 Hotel Cimarosa, Via Domenico Cimarosa, 29 (Piazza Fuga Centrale ), ☎ +39 081 556 7044, fax: +39 081 578 2852, e-mail: info@hotelcimarosa.it. Elegant hotel on the hillside of the Vomero neighborhood. 16 Hotel Clarean Naples Italy, Piazza Garibaldi, 49 (Garibaldi 1 ), ☎ +39 081 553 5683, +39 081 563 4828, fax: +39 081 563 4463, e-mail: info@hotelclarean.it. A modern and trendy hotel, opened in September 2004. 17 Hotel Eden Naples Italy, Corso Novara, 9 (Piazza Garibaldi 2 ), ☎ +39 081 554 6666, fax: +39 081 281 983, e-mail: info@hoteledennapoli.it. This hotel was reopened at the beginning of November 2005 after a massive reconstruction supervised by the architect Raffaele Zucchi, design engineer of the twin building Hotel Clarean. 18 Hotel Europeo, Via Mezzocannone, 109 (near Piazza S. Domenico Maggiore), ☎ +39 081 551 7254, e-mail: info@hoteleuropeonapoli.com. Make sure to book early, as it literally can get booked out overnight. Most of the 27 rooms have telephone, free wireless internet, some satellite TV and are modern and clean, which is not given for all hotels in Naples. Very friendly, helpful and English speaking people there, too. Overall very nice place to be, which you wouldn't expect from the outside. Finding the entrance to this backyard hotel can be a little tricky. Coming from the Spaccanapoli follow Via Mezzocannone down for about 40 metres, entrance is right of a café – both inside a little patio. 19 Hotel Garibaldi, Via Pasquale Stanislao Mancini, 11 (Garibaldi 1 ), ☎ +39 081 563 0656, e-mail: info@hotelgaribaldinapoli.com. Near the central station. Rooms are spacious and very clean. Staff is friendly. Prices begin from €60 for a double room with bathroom, satellite TV, safe, aircon and Italian-style breakfast. 20 Hotel Ideal, Piazza Garibaldi, 99 (Garibaldi 1 ; 100m from central station), ☎ +39 081 202 246, fax: +39 081 285 942, e-mail: info@albergoideal.it. Hotel is clean and cheap, staff are friendly and helpful. Breakfast included. 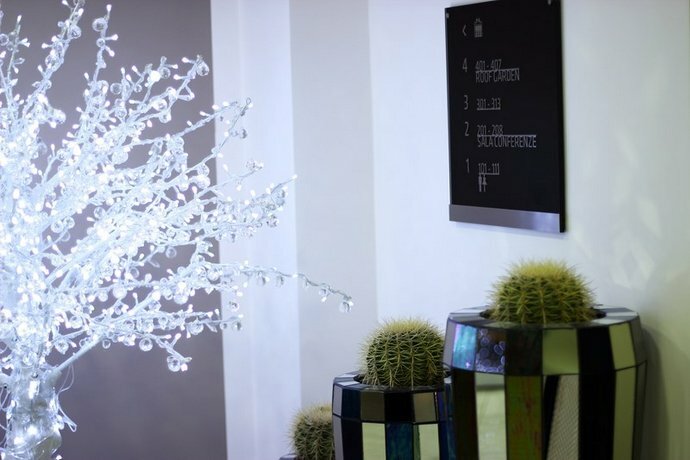 Hotel Micalò Napoli, Riviera di Chiaia, 88 (Mergellina 2 ), ☎ +39 081 761 7131. Almost hidden on the 2nd floor of a 17th-century palazzo, this hotel has been crafted out of the natural white stone of Southern Italy. 21 Hotel Nuovo Rebecchino, Corso Garibaldi, 356 (Garibaldi 1 ), ☎ +39 081 553 5327. Three-star hotel, one of the oldest in the city of Naples and restored in 2015. 22 Hotel Nuvò, Via Nuova Agnano, 5 (Agnano Cumana ), ☎ +39 081 195 66566, e-mail: info@hotelnuvo.it. Four-star hotel with comfortable and soundproof rooms, satellite TV, internet, minibar, air conditioning. 23 Hotel Piazza Bellini, Via S.M. di Costantinopoli, 101 (Dante 1 ), ☎ +39 081 451 732, e-mail: info@hotelpiazzabellini.com. Near San Gregorio Armeno church and university. Breakfast included. Starting from €58. 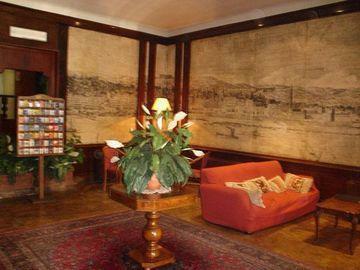 Hotel Prati, Via Cesare Rosaroll, 4 (in Piazza Principe Umberto, 200 m from the central railway station). 43 rooms, provided with bathroom, shower, telephone, central heating, bar and TV. Restaurant 70-seat dining-room. Staff speaks English, French, Spanish and German. 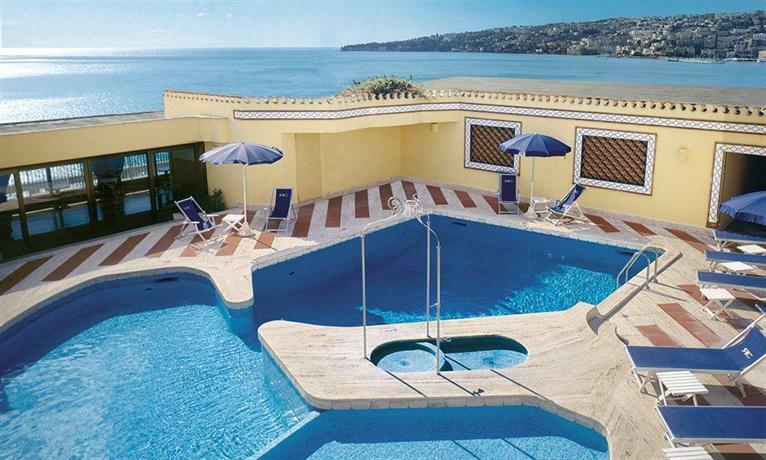 Hotel Splendid, Via Manzoni, 96 (Posillipo alto), ☎ +39 081 714 1955, fax: +39 081 714 6431. Locally famous for its wonderful view. Single, double and triple rooms are available equipped with Internet connection, TV, telephone, minibar and air conditioning. 24 Hotel Toledo Napoli, Via Montecalvario, 15 (Toledo 1 ), ☎ +39 081 406 800, fax: +39 081 406 800. In an ancient three-storey building dated 1725, with elevator, in the new modern style of furnishings in the centre of Naples. 25 Le Chemineè Business hotel Napoli, Via Stadera, 91, ☎ +39 081 584 6651, e-mail: info@lecheminee.com. This is the building that housed the old "Stingo" ceramic factory that was active in Naples from as early as the end of the 19th Century, into an elegant. It was restored and transformed into a modern 4-star hotel. Phlegrean Fields Park. Double room from €50/night breakfast included. 26 Tribù B&B, Via dei Tribunali, 329, ☎ +39 081 454 793, +39 338 409 913, e-mail: tribunapoli@katamail.com. On a quiet patio in the middle of Spaccanapoli, Naples' old town, this tasteful bed & breakfast also doubles as an arts showroom. Breakfast is served on a nice terrace by the couple of young architects that own the place. Rooms €60-100. 27 B&B Amedeo, Via Francesco Crispi, 26 (Piazza Amedeo 2 ), ☎ +39 320 069 7484, e-mail: federicovolpe@bbamedeo.it. Single €50-60, double €70-80, triple room €90-100 (including breakfast). Prices are per room. 28 Eurostars Hotel Excelsior, Via Partenope, 48, ☎ +39 081 764 0111, e-mail: reservations@eurostarsexcelsior.com. Check-in: 14:00, check-out: 00:00. On the seafront next to the iconic Castel dell'Ovo, with spectacular panoramic views of Vesuvius, the Gulf of Naples and the island of Capri. The Eurostars Excelsior Hotel is home to 100 luxury rooms and 22 suites of varying categories. 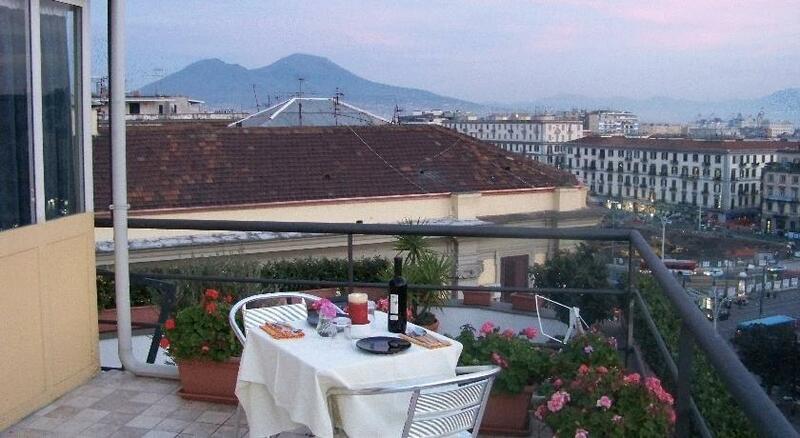 The hotel also has the excellent Ristorante La Terrazza in the roof garden. 29 Grand Hotel Santa Lucia, Via Partenope, 46, ☎ +39 081 764 0666, toll-free: +39 081 764 8580, e-mail: info@santalucia.it. Elegant hotel on the waterfront, in front of Castel dell'Ovo and the tourist port of Santa Lucia. 30 Grand Hotel Vesuvio, Via Partenope, 45 (in front of Castel dell'Ovo), ☎ +39 081 764 0044, e-mail: info@vesuvio.it. Elegant 5-star deluxe hotel on the seafront. 160 rooms with 21 suites, 2 panoramic restaurants, fitness club with indoor pool, function rooms, private cabin cruiser, limo service and garage. 31 Hotel Paradiso, Via Catullo, 11 (In Posillipo), ☎ +39 081 247 5111, fax: +39 081 761 3449, e-mail: info@hotelparadisonapoli.it. €160 for a double room with a balcony. 32 Hotel Pinto Storey, Via Giuseppe Martucci, 72 (Piazza Amedeo 2 ), ☎ +39 081 681 260, fax: +39 081-667536, e-mail: info@pintostorey.it. An Art Nouveau building in Chiaia district, few steps from Piazza Amedeo. For a double room prices are from €110 on, depending on the season..
33 Portalba Relais, Via Portalba, 33 (Dante 1 ), ☎ +39 081 564 5171, fax: +39 081 5443703, e-mail: info@portalbarelais.com. Bed & breakfast in the historic centre, few steps from Piazza Dante. 34 Romeo Hotel, Via Cristoforo Colombo, 45 (Municipio 1 ), ☎ +39 081 017 5001, e-mail: welcome@romeohotel.it. Five-star boutique hotel on the waterfront in the historic centre, few steps away from the port. The city has an inequitable distribution of wealth and it is possible to find run-down areas and elegant quarters quite close. Typical examples of places better to avoid after dark are the "Quartieri Spagnoli" (Spanish Quarters) and the "Sanità", both in the historic centre, that are reasonably safe during the day and also have notable points of interest. Especially to be avoided, but of no practical interest for tourists, is Scampia, where there is much petty crime and drug traffic. Naples' bad reputation regarding safety is mainly due to stereotypes, since the city's security level is actually comparable to many other European big cities (e.g., Barcelona, Marseille, Amsterdam). Petty thievery and muggings definitely do happen so be reasonably watchful, avoid empty streets and dimly-lit alleys at night, and keep your wits about yourself. On the other hand, since weather is generally nice, Neapolitans spend a lot of time in the streets, including in the winter and at night. Places like Mergellina and the boardwalk of Via Caracciolo are generally full of people till late at night and very safe. Contrary to what newspapers, books and movies seem to suggest, the local mafia (Camorra) poses little or no threat to tourists, since it is involved in activities like prostitution (which is illegal in Italy), racketeering and drug trafficking. Do not wear expensive watches or flashy jewellery. Do not wander down small dark alleys/streets, especially in the Spanish Quarters. Be careful around the main train station as there are many thieves in the area. Piazza Garibaldi, the large square in front of the station, is no place to spend more time than necessary, especially at night. Generally, the southern side of the square (on your left when exiting the station) is safer than its northern part. You can buy over-the-shoulder packs that are excellent, as they allow you to keep an eye and firm grip on your valuables. Beware of people who want to involve you in fake road accidents. It is advisable not to wear football shirts of any club, especially Juventus FC, AC Milan, Internazionale Milano, AS Roma, SS Lazio or Fiorentina. Soccer is taken very seriously in Naples, and Neapolitans support SSC Napoli with big rivalries with those clubs. However, it is very safe to wear the Genoa club shirt (vertically spangled of red and blue, and sporting a griffin like a symbol; not to be confused with the other Genoa club, Sampdoria), since supporters of this team have a strong friendship with SSC Napoli supporters. If you ever hang out in Fuorigrotta borough on Sundays, near the San Paolo stadium, and are surprised by a booming shout of thousands of people, don't get scared: it's only cheering for the Napoli soccer team which just scored. Since when this happens, most of the town shouts along with the people in the stadium, this is perceived like an earthquake by the local volcanic observatory of Vesuvius! There is fast express train service to Rome and points north, as well as points south. Naples is the ultimate terminus for the FR7 line of the Rome commuter rail network, which runs from Roma Termini to Minturno-Scauri, Sessa Aurunca-Rocca or Naples. There are also local Italian Railway trains to Pompeii, but for such short distances, it is easiest to take the Circumvesuviana commuter train. It's easy to find ferries to places like Sicily. Solfatara (12 km). It is a shallow volcanic crater at Pozzuoli, part of the Campi Flegrei volcanic area. It is a dormant volcano, which still emits jets of steam with sulphurous fumes. Herculaneum (13 km). A world-famous archeological site, part of the UNESCO World Heritage list. It was an ancient Roman town destroyed, together with Pompeii, Oplontis and Stabiae, by volcanic pyroclastic flows of Vesuvius, AD 79. It is famous as the source of the first Roman skeletal and physical remains available for study that were located by science, since the Romans almost universally cremated their dead. While smaller than Pompeii, it's just as cool and usually less busy. Pompeii (25 km, 40 minutes via the Circumvesuviana train, Sorrento line). The world-famous city of Pompeii is a partially buried Roman urban center, and one of the best examples of Roman architecture in the world. Along with Herculaneum, Pompeii was destroyed and completely buried during a long catastrophic eruption of the volcano Mount Vesuvius spanning two days in the year AD 79. The eruption buried Pompeii under 4 to 6 m (13 to 20 ft) of ash and pumice, and it was lost for nearly 1700 years before its accidental rediscovery in 1749. Since then, its excavation has provided an extraordinarily detailed insight into the life of a city at the height of the Roman Empire. Today, this UNESCO World Heritage Site is one of the most popular tourist attractions of Italy, with approximately 2,500,000 visitors every year. Visiting the city is a unique experience—you get to walk in and out of most of the ruins, and really get a feel for how the city must've looked in its era. Royal Palace of Caserta (37 km). A former royal residence in Caserta, southern Italy, constructed for the Bourbon kings of Naples. It was the largest palace and one of the largest buildings erected in Europe during the 18th century. In 1997, the Palace was designated a UNESCO World Heritage Site, described in its nomination as "the swan song of the spectacular art of the Baroque, from which it adopted all the features needed to create the illusions of multidirectional space". Capri (40 km by boat or hydrofoil) A world-famous destination, it is an island on the south side of the Gulf of Naples, which has been a resort since the time of the Roman Republic. Features of the island are the Marina Piccola (the little harbour), the Belvedere of Tragara, which is a high panoramic promenade lined with villas, the limestone crags called sea stacks that project above the sea (the Faraglioni), Anacapri, the Blue Grotto (Grotta Azzurra), and the ruins of the Imperial Roman villas. Capri is the place where the last Roman emperor, Romulus Augustus was imprisoned. The circumstance (and the imaginary salvatage of the emperor) has been featured in the movie The last legion, starring Colin Firth along with Sir Ben Kingsley and Aishwarya Rai. Procida (37 km by boat or hydrofoil) Procida is one of the Flegrean Islands off the coast of Naples, it lies between Cape Miseno and the island of Ischia. Procida was held by Mycene in the period between the 16th and 15th centuries BC. During the 8th century BC the first Greek settlers to this island were immediately replaced by other Greek peoples coming from Cuma. During Roman rule, Procida became a renowned resort for the patrician class of Rome. Nowadays, it is a renowned spa resort. San Leucio (38 km) San Leucio is a frazione of the comune of Caserta, most notable for a resort developed around an old silk factory, included in the UNESCO World Heritage sites list in 1997. In 1750 Charles VII of Naples selected this place for an unusual social and tecnological experiment, a different model of silk production based on technical innovation and alert to the needs of workers. It is considered one of the first examples of socialism, a closed community where life and work were closely connected and planned. Today the San Leucio heritage still survives today in the local silk and textile firms, which work on an international scale to elite foreign clients as the Buckingham Palace, the White House, the Quirinale Palace, the Palazzo Chigi. Ischia (40 km by boat or hydrofoil) is a volcanic island which lies at the northern end of the Gulf of Naples. It is the largest of the Phlegrean Islands. The main industry is tourism, centering on thermal spas that cater mostly to European (especially German) and Asian tourists eager to enjoy the fruits of the island's natural volcanic activity, its thermal hot springs, and its volcanic mud. For many of the inhabitants on the Italian-speaking island, German and English are second languages. This is because of the large number of German- and English-speaking tourists who visit the island each year. Sorrento (50 km). A popular tourist destination which can be reached easily from Naples and Pompeii, as it lies at the south-eastern end of the Circumvesuviana rail line. The town overlooks the Bay of Naples as the key place of the Sorrentine Peninsula, and many viewpoints allow sight of Naples itself, Vesuvius and the Isle of Capri. Sorrento's sea cliffs and luxury hotels have attracted notable people, including Enrico Caruso and Luciano Pavarotti. Sorrento was the birthplace of the poet Torquato Tasso, author of the Gerusalemme Liberata. The town was quite famously featured in the early-20th-century song "Torna a Surriento" (Come Back to Sorrento) an iconic example of the Neapolitan song. Amalfi coast (70 km) is a stretch of coastline in the Province of Salerno in Southern Italy. It is a popular tourist destination for the region and Italy as a whole, attracting thousands of tourists annually. Aside from the chance to visit the renowned towns of Amalfi (one of the four ancient Maritime Republics of Italy), Positano and Ravello (which hosts the Wagner festival); the Amalfi coast offers to trekkers the opportunity of walking on the "Sentiero degli Dei" (The Walk of Gods), a stunning dirt road suspended on the cliffs between the Mediterranean sea and the mountains. The area is also well known for the limoncello, a digestive liquor made out of lemons. Paestum Greek Temples (104 km). Near Salerno, there are three major temples in Doric style, dating from the first half of the 6th century BC. These were dedicated to Hera (only slightly smaller than the Parthenon); and Athena, and are one of the best conserved examples of Doric architecture.